After yesterdays Rakhi party at home I am damn tired today. I have not been keeping well for quite sometime but rakhi is a day which I cannot miss. Its a pleasure to have my brothers and cousins over at my place and see them lovingly tucking in all the food that I prepare for them. Its an occasional chance for us to have a get together where almost every one is present. Provided there work schedule I appreciate their effort to keep the rakhi evening free for me. I guess my enthusiasm has rubbed on them and now a days they look forward to the day as much as I do. But with their varied choice of food preparing the menu is a real work for me. Some don't eat meat, some do not eat anything other than meat, some like it spicy where some like it little on the sweeter side. Keeping all their preferences in mind this year I cooked a huge spread of vada pav complete with 3 different types of chutneys and fried green chilies, Narkel er Ghugni, Vanilla shortcake with fresh cream, Mangoes and chocolates, jeera rice, Naan, Murg Makhani, Kadhai paneer and Chana'r Jalebi. I worked the whole morning but it was totally worth it. Will try to post all these delicacies one by one but right now am so tired that making this easy spaghetti recipe for dinner tonight. 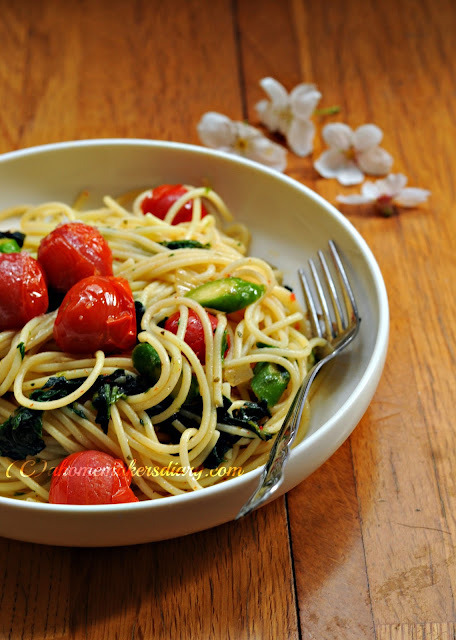 This is a very quick recipe which tastes awesome with fresh spinach, fresh veggies and juicy succulent cherry tomatoes. I often roast these tiny jewel like vegetable with just salt, pepper and olive oil and enjoy with toated breads. But it tastes super yummy with spaghettis, a juicy surprise with every mouthful. Cut the woody ends of the asparagus and cut them in 1/2" pieces. wash and keep aside. Take a big pan full of water to boil with 1/2 tsp salt and 1/2 tsp oil. When it starts to boil add the spaghetti and cook as per package instruction. Just during last 3-4 minutes add the asparagus. once the Spaghetti is cooked (soft but not mushy) drain them on a colander or sieve and keep aside. Wash and pat dry the cherry tomatoes. I like the round ones more for their juicy sweet taste. take a big piece of aluminium foil and place the tomatoes in it. Sprinkle little salt and freshly crushed or pre-made pepper powder. Drizzle 1 tbsp olive oil and bring the foil ends together to form a pouch. place it on an iron skillet and cook on medium flame. Let it char for 5-6 minutes. Carefully open the pouch and turn the tomatoes and cook for another 2-3 minutes. By the end the skin of the tomatoes will start to come off and you will get a lovely charred smell. Keep it aside. Alternatively you can use the oven to roast them. Just make the pouch and place it in a pre-heated oven (200C) for 10-12 minutes. Heat the rest of the oil in a heavy bottom pan and sizzle the chopped garlic till aromatic. Add the chopped spinach and a pinch of salt. cook on medium for a minute or till they start to wilt. 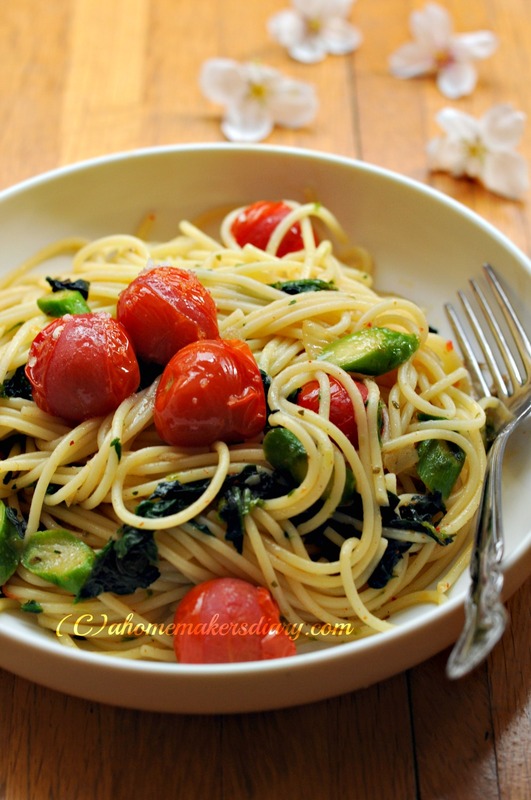 add the Boiled spaghetti, salt, pepper powder and oregano or any herb you are using here. give it a good mix and cook for 3-4 minutes. Finally just mix in the charred tomatoes with all its juice and oil. Mix and serve with grated cheese on top. Enjoy this hot off the skillet for better taste. Use any vegetable you get, Its not necessary to use the ones I mentioned here. You can opt for beans, Carrots or any greens you get at your local store. Even you can use any type of Pasta but as this recipe does not involve any sauce so its always better to use the smaller variety of pasta like farfalle, orzo, macaroni (conchiglie), campanelle, caserecci or cavetelle. Love this! A quick satisfying meal. We too love it. Spaghetti looks so delicious and mouthwatering inviting. Such a comforting meal. Love the colours of the veggies. Perfect simple and humble meal. I really like the clarity in your pictures. 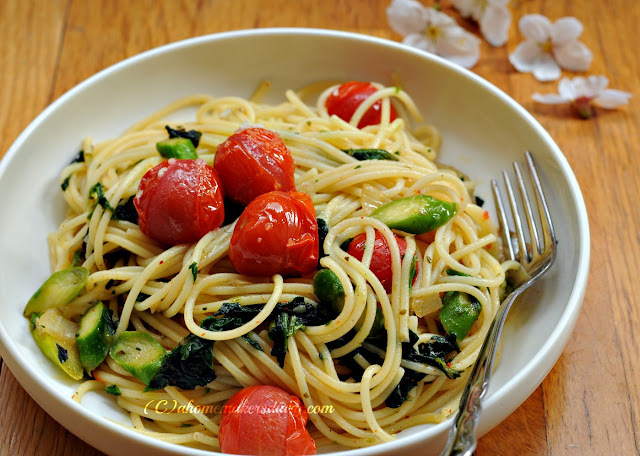 Spaghetti looks very colorful and delicious. Enjoyed reading your party menu...yummy! sure your guests are lucky. beautiful clicks and spaghetti looks delicious. Awesome & inviting click dear.. Love this simple sphaghetti !